After continuing our journey with John Crichton last week with “Taking the Stone” and “Crackers Don’t Matter,” our Farscape re-watch continues this week with the fifth and sixth episodes of Season 2. We open on an interior shot of what we assume is Moya, when suddenly a squad of Peacekeepers start marching down the corridor. “Wait!,” we think, “this can’t be Moya, can it?,” a thought that seems to be confirmed when they reach the Pilot’s den and a female voice comes out of her mouth rather than the male one we are used to. 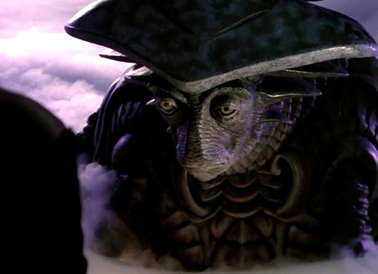 The scene includes a number of shots filmed with a digital video camera, which gives it a documentary-like feel unlike any other scene in Farscape‘s history up to this point, making it feel visceral and immediate. An argument ensues in which the man who seems to be the head Peacekeeper–who we now learn is called Velorek–tells her that he’s going to give her one last chance to comply, and this Pilot refuses, infuriated that they have rendered her Leviathan unconscious (an ordeal which we know from previous episodes is incredibly dangerous and from which many Leviathans don’t survive) in order to enact some sort of secret project that could put her life in jeopardy. A moment later, who should arrive on the scene but Crais, back in his full Peacekeeper glory? This is the first moment in which the viewer starts to realize that this has to be a flashback of some sort. Overriding Velorek, who was trying to reason with the Pilot, Crais announces that they already have another Pilot, and orders his guards to open fire. And the squadron of Peacekeepers, which does not include Velorek, ends the Pilot’s life in a barrage of pulse pistol blasts, a moment as horrifying as any we have ever seen on Farscape. At that point, the camera zooms in one of the executioners in particular, whose helmet comes off a moment later to reveal…Aeryn Sun. Her image then freezes to reveal Crichton and Chiana in the present day watching this video that Chiana had discovered while sorting through PK storage in Moya’s upper tiers. So the ship in the tape was Moya, who we now know had had a previous Pilot who Aeryn had helped murder. BAM. And thus begins one of Farscape‘s all-time greatest episodes, one which I have referenced many times in previous posts and which is monumentally important, not only for revealing bitter, shocking truths about both Aeryn and later, our Pilot’s, pasts, turning many things we expected on their heads, but also for layering in significant new information about the bond between Pilots and Leviathans, and about Moya in particular, using all of this new knowledge–part-mythology, part-character-history–to add new context and further layers to all that came before it, as well as all that is to come. “The Way We Weren’t” is so key an episode that I likely could have brought up some link to it in my reviews of every previous one, as its implications ripple outwards in ways that, on subsequent viewings of the entire series, can make you see countless past events in a different and often more complex light. What might be most remarkable about how it’s written, however, is that it is far from a simple infodump hour but one of the most emotionally-driven and devastating episodes of the entire series. And, although like “Crackers Don’t Matter” before it (and how amazing that two of the series’ all-time best episodes occurred back-to-back), it is set almost exclusively aboard Moya, besides one flashback scene, it manages to feel epic and truly mythic in scope, while again, also being entirely rooted in character. It’s a stunningly brave story for numerous reasons, the first being how it forces the other characters and the viewers to really confront the full implications of Aeryn’s past for the first time. For those of you who have never heard the fandom term, “woobify,” it refers to the propensity for some fans to be overly forgiving of reformed villains, completely disregarding any past or even current misdeeds to the point of justifying them even when they were/are genuinely reprehensible, a reading that actually minimizes the characters, rendering them far less interesting. Farscape refuses to allow you to do that here. While everyone is horrified by learning what Aeryn did and turns on her (other than John), Chiana–no stranger herself to moral ambiguity–actually makes the wisest remark, which is, “What have you guys been thinking all this time? What? She was out picking baskets of rolliss buds while all the other mean Peacekeepers did all the really nasty stuff? She was a Peacekeeper.” And that boils down the issue to its essence which is that, in the last year, they’ve all grown so accustomed to Aeryn that they have basically had to put her past out of their minds in order to accept her, likely a largely unconscious act for most of them, but this is a harsh reminder that, before she chose to escape on Moya in “Premiere,” she followed her PK training to the letter, never questioning her orders. And this is a rude, horrific reminder of what that actually means. There certainly is hypocrisy in their reactions, and Aeryn points it out in particular to Zhaan, who rather self-righteously remarks, “I…can’t accept the cold-blooded slaughter of such a helpless creature,” to which Aeryn cuttingly but fairly replies, “Oh, it’s perfectly fine to cut off one of his arms then, is it, Zhaan?” At the same time, though, Aeryn is just as disgusted by who she was back then as most of them are now. “You think I lack compassion?” she asks Zhaan later in the episode. “That Pilot is right and that I defile Moya with my presence? Well, you know what? He’s right, and you are right,” which chastens Zhaan. One thing that Farscape has always done well is to show multiple sides to every character. Even the usually kind, wise priest isn’t so kind or wise here. She is actually pretty awful to Aeryn, and, again, extremely hypocritical given not only what she did to Pilot but her own past crimes that led to her incarceration. And we aren’t encouraged to side with Zhaan here whatsoever, while at the same time, it’s possible to empathize with both perspectives. After having seen that video, we are just as shocked as Zhaan, which makes her initial reaction understandable, and when one puts into perspective how she has suffered at the hands of the Peacekeepers, it’s no wonder that being so harshly reminded of what they are capable of–and yes, even Aeryn–could at least for a while blind her to how Aeryn has changed and grown.